Some things in life have no earthly explanation. Series creator Don Jacobson and K-LOVE Radio have joined together to produce one of the most remarkable collections of modern-day miracles ever compiled. 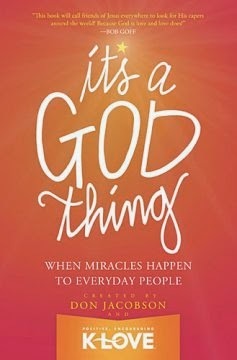 From angel appearances in hospital rooms to a mother saved from a would-be assailant in Hyde Park, from a young autistic girl becoming a beautiful ballerina overnight to a young backpacker who walked away from a terrorist attack, It's a God Thing presents some of the most amazing stories of God's hand on our lives. Once I started reading this book, I didn't want to put it down! I'm a crier, so most of the stories made me teary. But mostly, time and time again, I was reminded that God is good. The book is a collection of 46 stories different people, written in their own words, of when they experienced something that they knew just had to be a God thing. The stories make you feel connected to the author. This book is an easy read, with each story only a few pages long, making it a good choice for moms who can only spare a few minutes here or there to dip into a book. Miracles do happen and have happened in my life. I was reminded that miracles don't have to be on a grand scale. It can be as simple as God putting someone directly in your life to pray for you or giving you one last glorious day with the person you love.